When you think sunshine and flowers most likely your first thought is sunflowers. They’re large, bright headed blooms make the sunflower one of the most recognized flower around the world. Sunflowers originated in the Americas and Europe, and were then cultivated as a valuable food source for centuries. Artists throughout history loved the sunflower’s unique splendor—those of the Impressionist Era were especially fixated on the flower. You will often see photographs of wild sunflowers with their tall stalks stretched out trying to reach the sun. The receiving of a sunflower means the feeling of adoration, admiration, and platonic love towards a person, such as a family member or friend. It will give the feeling of positivity and strength. It would be a sure way to brighten up their day. Aside from being beautiful and important symbolically, the sunflower is downright useful. Almost all varieties produce edible and good-tasting seeds with plenty of health benefits. The sunflower was common in American Indian tribes in North America. It is said that the plant was cultivated by the American Indians in present day Arizona and New Mexico around 3000BC. Some experts say the sunflower was domesticated even before corn! Used in many different ways when it came to food, the sunflower was a significant food source to the American Indians. The seeds where ground up and used in flour for cakes, mush and bread. Some mixed them with vegetables and some ate them as a snack but cracking the shell and just eating the seed (like we do today). Sunflowers were used for more than food purposes too, such as purple dyes, body painting and decorations. Parts of the plant were also used for medical purposes from snakebites to body ointments. Sunflower oil (from the seed) was used in the hair and on skin and the dried stalk of the flower was used as building material. The whole plant including the seeds was very often used in American Indian ceremonies. Who knew so much use could come from a flower? 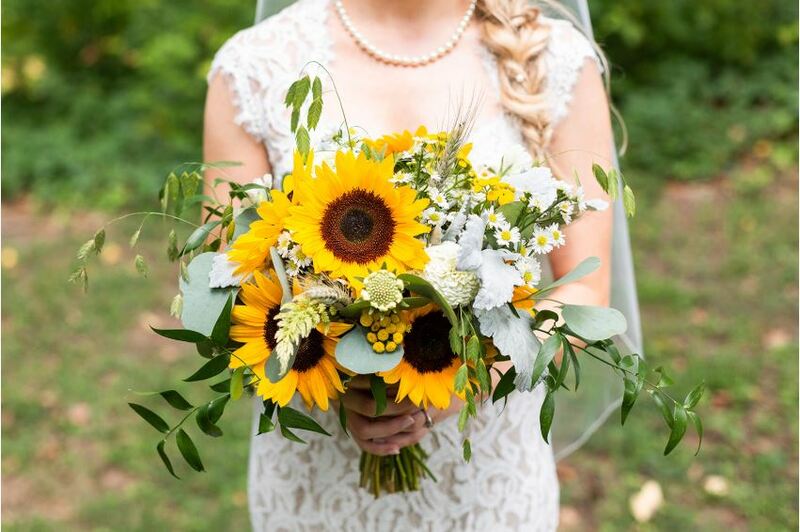 Sunflowers are heavily used in wedding decor and personal flowers such as bridal bouquets and centerpieces.